Matteo Salvini – an unimaginative, anti-EU sideman in Europe’s political landscape? How much of a shift? Humiliated at the last national elections with just over 4% of the vote in both the Chamber of Deputies and the Senate, Salvini’s Lega is now polling in the 14-15% range. The ongoing question of migrant rescues in the Mediterranean and fears of Italy being “invaded” by non-Europeans (or even Eastern Europeans, one scapegoat is as good as another), as well as his efforts to create a picture of constant conflict with the EU have helped boost the party in recent years. He has also made an effort to shift the party’s tone from explicit regionalism with a northern focus to a general anti-EU and anti-immigration stance. As party leader since 2013, he had also worked to widen his appeal within Italy with a sister party Noi Con Salvini aiming to spread his support in Southern Italy (one must remember that Lega Nord previously campaigned for Northern Italy to form its own independent state to avoid “propping up” the South economically, so they might not make big gains in the South unless Salvini’s personal brand gains traction there). However, certain elements within the party and its support base have not shared this ideological shift. The party currently holds the presidency of Italy’s Lombardy (Roberto Maroni) and Veneto (Luca Zaia) regions, which are also considered its strongest historical support bases as well as key regions in Italy from an economic perspective. And in relation to this shift towards “national” policy, the October referendums on greater autonomy held in these two regions could provide a major obstacle. The Lega party in both regions backed the referendums, which are advisory, but the results show strong support across the political spectrum in these regions for more autonomy. One of the main motivators was greater control of finances, as the regions contribute more than they receive from the central government. Lombardy in particular is a big hitter, counting for approximately 21% of Italy’s GDP, double that of Lazio, the next region (according to Pagella Politica, an Italian fact-checking website), and with 10 million people, roughly one-sixth of Italy’s total population (as per ISTAT data from June of this year). Lombardy’s president, Roberto Maroni, conscious of the messages this could send, has taken the more pragmatic route of declaring his intention to pursue talks on expanding regional autonomy as provided for in Articles 116, 117 and 119 of the Italian constitution. Luca Zaia on the other hand, has gone straight for a more provocative approach, that of demanding the status of Automomous Region proper (which is that accorded to Trentino-Alto Adigo/Südtirol, Vallée d’Aoste, Sardinia, Sicily, and my home region of Friuli-Venezia Giulia). This can be termed a provocation as this special statute brings with it extensive economic and administrative devolution, and the regions with such status have significant regional/historical minority populations and cultures (and in the case of Slovenes in Friuli-Venezia-Giulia, German speakers in Südtirol, and French speakers in Vallé d’Aoste, they suffered persecution and forced Italianisation during the fascist period). This last declaration from Zaia, poor taste aside, would just reinforce the message that certain regions of Northern Italy want to wash their hands of the South in socio-economic terms and close in on themselves, which in turn could hurt Salvini’s attempts to expand his appeal in the South. And now onto what makes Salvini an unimaginative, and frankly boring character. For all his fiery rhetoric, he offers nothing new, and in fact just piggy-backs off old fear and nostalgia for a nonexistent past. His own personal re-branding is nothing short of ridiculous, shifting from a style that can best be summarised as that of an awkward student activist (see cover photo) to an attempt to present himself as a sort of everyday law-and-order hard-man (he likes to make an appearance in police uniforms, which the Italian police union has criticised him for), although this latter strategy has revolved mainly around keeping short hair and a beard, and simply bulking up rather than any serious improvement in physical fitness. A look at his campaigning doesn’t show much more creativity either, as his campaign placards bear an uncanny resemblance to those used by Trump. In terms of policy, he has absolutely nothing original to offer, tending to work himself up about (and distorting facts with regard to) EU regulations. The last example was on the directive allowing the use of insects in food products, which he tried to twist into the EU “imposing” insect-based food on consumers, apparently unaware of people’s understanding of market mechanisms with regard to such products (i.e. if they don’t want them, they don’t buy them, and that’s the end of it). He also jumped at the chance to defend a neo-Nazi group’s decision to show up uninvited at a social centre that organises help for migrants and read them what essentially translated to a thinly-veiled threat to stop helping migrants and acting as a “magnet” for them (never mind that this was in Como, a town in the very North of Italy, and not a particularly big one, or one that would offer reasons for large-scale migrant movements there except maybe the possibility of crossing into Switzerland). Regardless of one’s own position on the issue, this serves to highlight the extent to which he needs to piggyback on specific episodes for visibility rather than draw up coherent policies to persuade voters. Matteo Salvini in police uniform, trying to cultivate a tough-guy image. So what did I mean by his status as a “sideman”? If we look at Salvini’s brand within the context of nativist populism as a whole, he is far from a leader, seeking endorsement from others rather than inspiring them. 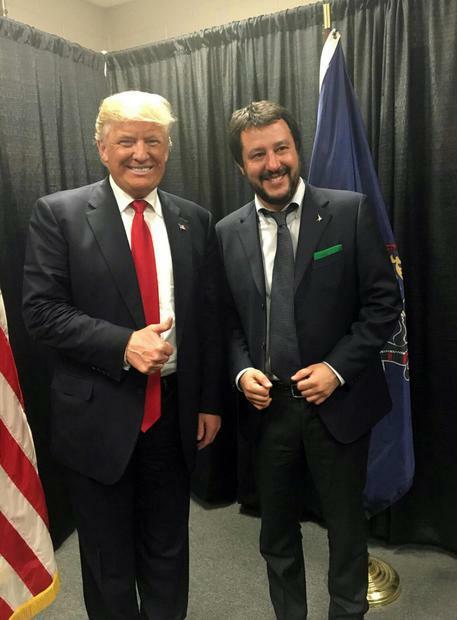 Although Salvini has since criticised Trump for apparently not living up to his ideals (whatever they might be), one need look no further than the effort he made to meet Trump in Philadelphia in 2016, which he attempted to use as a launchpad for his image abroad as well as any hypothetical campaign in Italy. Despite photos of the two shaking hands and standing next to each other, and several news websites (reputable and not so much) claiming that the two men agreed on several issues and exchanged pleasantries, Trump then claimed in an interview to the Hollywood Reporter that he didn’t want to meet him (despite evidence that Salvini had lobbied Amato Berardi, head of the National Italian American Political Action Committee, with the explicit aim of organising the meeting). Some argue that Trump may have quite simply not known who Salvini was (something Trumps himself declared), mistaking the photo-op for a meet-up with a supporter like any other, it could also indicate Trump seeing no real advantage in showing him support, unlike his praise for people like Putin, Duterte and others. Furthermore, if he is really a champion of Italian national pride and interest, it seems strange that he praised Giuliano Bignasca, the late Swiss firebrand who, despite close ties with Lega Nord’s previous leader Umberto Bossi, always maintained a virulent anti-Italian position. Throughout his political life he issued several provocations such as declaring that a wall like the one dividing Israel and the Palestinian Territories should divide Canton Ticino from Lombardy, or implying that if the Lombard provinces of Lecco, Varese, Como, and Bergamo got their act together, he would welcome their annexation to Switzerland (he showed a map of this hypothetical annexation in this interview on EspansioneTV). His desire to complicate life for Italian frontier workers employed in Canton Ticino (roughly 25% of the Canton’s workforce) was such that in 2011 he successfully blocked the transfer to Italy of payroll taxes earned by these frontier workers, requiring a summit in Bern between the Swiss and Italian governments to resolve the issue (as reported by his obituary in Corriere Della Sera). The fact that Salvini reserved words of praise to such an individual reveals not only poor judgement, but also a pathetic weakness, and if he is the one to protect Italians, and in his case, the people of Lombardy, this is a ridiculous shot in the foot and in fact praises someone who built his career on anti-Italian sentiment in a foreign country. He is also keen to show himself as part of some anti-EU alliance with other nativist leaders such as Wilders, Putin, and Le Pen, yet despite kind words from these leaders, he does not inspire any of them, rather drawing inspiration from them and using references to them in his own campaigns much more than his presence manifests itself in their campaign material. Perhaps more alarming are the deep ties between Lega Nord and Putin’s United Russia party, explained in this video. The two parties signed a cooperation pact, and at Salvini’s inauguration as party leader in 2013, Aleksei Komov and Viktor Zubarev were present and gave speeches. None of this points to strength, in fact quite the opposite: it points to a man and a party willing to accept, and even welcome interference from an authoritarian state which wishes to use Salvini, Le Pen, and co. as a Trojan horse to weaken the European project. Despite all this, Salvini is not to be taken lightly. His rabble-rousing style manages to convince the angry and impressionable, and of course, his promises of vigilantism and defense of “italianità” play well to those Italians who are nostalgic for the “good old days” of figures like Mussolini (most of whom never never experienced them, and the destruction visited on Italy as a result of said “good old days”) and the Italian Lira (never mentioning of course, the problems with inflation as well as the tendency to devalue the Lira to avoid undertaking serious economic reforms). As if further proof was needed, his defense of neo-nazi groups shows just how keen he is to play to extremists and nostalgic fascists. What’s more, he’s hardly the only one peddling such views, and could in fact contribute to a large part of the political spectrum campaigning on more anti-EU lines, be it subtly or explicitly. Fratelli d’Italia, a nationalist and eurosceptic party headed by Giorgia Meloni, a former Berlusconi minister, is set to make the threshold for Parliamentary representation (Termometro Politico currently give the party just under 5% of the vote). In the recent municipal elections in Ostia (in Rome’s metropolitan area), the neofascist CasaPound party scored 9% of the vote. Even more worryingly, the Movimento 5 Stelle is currently Italy’s first party, polling at 28,5%. While their status as a catch-all party means their voter base is not necessarily aligned with that of these more nativist parties, the party leadership could very easily choose to run on a hard-line positions (at least on certain issues) to capitalise on salient issues and harness the popular anger that runs deep as the average Italian still sees little benefits from the economic recovery taking place thanks to strong growth in the Eurozone. In a sense, the problem isn’t even that Salvini could take a serious share of the vote. The problem is that increasingly, candidates with his views, lack of intelligence or original ideas, influenced by hard-right movements and personalities from outside Italy, are now increasingly normalised in the Italian political landscape. Let’s not take this lying down. This election has implications for Europe, not just Italy, and if the alt-right are going to throw their trolls and disinformation websites behind someone, that someone is Salvini. Let’s show that as Italians we’re capable of recognising him for the poser that he is, as well as his pathetic attempts to obtain validation from hard-right figures elsewhere. The choices aren’t great, but he, Meloni, and others like him represent a downgrade which make Italy weaker, not stronger. Ironically, it would make it liable to the “bullying” that Salvini accuses the EU of, by way of his sycophancy towards other leaders, so long as they’re anti-EU, and his acceptance of a lesser role among them. He’s been good at hiding this weakness because Italians haven’t called him out on it, now we mustn’t give him a place to hide. His hypocrisy and weakness must be exposed for all to see. Europe must grasp its place in the globe now.